Over the last year and a half, hundreds of students have taken my online beginning photography class. By FAR, the most common problem that Dustin and I have seen as we review photos from our students is poor sharpness. Sometimes, the photos are clearly blurry to the point that anyone would notice the problem. But most of the time, the photos have fair sharpness, but they just aren't quite as crisp and clear as they could be. It can be difficult for photographers to learn how to take tack sharp pictures because there is no silver bullet. The truth is that there are at least 7 mistakes that can lead to photos that aren't sharp. In today's lesson, we want to provide the ultimate resource for learning to take sharp photos. After looking at many many photos from beginning photographers and analyzing each one to determine what problem caused the photo to come out soft, we have determined that improper focusing technique is the number one culprit. Usually, the problem is that photographers are not as exact in their focusing as they should be. We often find that the photographer did not put the focus point on the subject's eye, and instead had the camera focus on the subject's shoulder, nose, forehead, etc. This is especially common with photographer who have not yet learned how to manually move the focus point that the camera is using. Check out this post if you need help with this. Another common problem stems from the use of the focus and recompose method of shooting. This method is used when the photographer wants to focus the camera on a spot where there is no focus point, and is especially common on entry-level DSLR cameras which only have 9 or 13 autofocus points. So the photographer uses the middle focus point and aims it at the subject's eye. Then the photographer holds down the shutter button half-way as she recomposes the photo to the proper framing for the picture, and then presses the rest of the way down. While this is the only practical way to focus on cameras that don't have enough focus points, it can lead to problems when shooting with shallow depth-of-field if the photographer shifts the angle of the camera while recomposing, or if her finger slips on the shutter button. For more advanced photographers, you might also like to learn how to do back button focus. How to fix it: If you need to use the focus and recompose method because your camera doesn't have a focus point for where you want to focus, use great care not to move the camera around too much which may alter the plane of focus. If you have enough autofocus points in your camera, moving the focus point around to match your composition is the preferred method. No photo is as sharp as it should be when it comes off the imaging sensor in your camera. To compensate for this, you'll need to apply some sharpening on the computer if you shoot in RAW. If you shoot in JPEG, then make sure the picture control/picture style set in your camera is applying some capture sharpening for you. There are many two main types of sharpening: capture and output. Both are necessary to produce crystal clear photos. Capture sharpening is used to compensate for inherent optical issues in all lenses and cameras. Capture sharpening is generally applied to a RAW photo as it is brought into Lightroom or Photoshop, and you may find that these programs are applying capture sharpening behind the scenes. Aside from sharpening the captured image, tack sharp photos also need to be sharpened at output. In general, the larger your final photo will be, the more sharpening you need to apply. For example, if I'm outputting a file for a 20″x30″ print (50×76 centimeters), then I would want to apply a lot of sharpness to the photo in Photoshop. For example, I might use these settings in Filter>Unsharp Mask: Amount 100, radius 2.3. At the same time, if I were printing a small photo, or using a smaller photo on the web, I would use much less sharpening: Amount 50, radius 1.7. While you want to be careful not to apply too much sharpening, a little bit of it goes a long way. Camera blur simply means that the camera moved while the image was being taken, resulting in a blurry photo. The most common cause of this is when a photographer mashes down the shutter button because they are excited. Pushing the shutter button too forcefully moves the camera and will always reduce the sharpness of the photo. Another common cause of camera blur is when the photographer uses too low of a shutter speed, so that the natural shaking of one's hands causes blur in the photo. No one, not even brain surgeons, can hold their hands perfectly steady. We all shake just slightly, and that can often be enough to cause a blurry photo if the photographer's shutter speed is too low. How to fix it: To fix camera blur, try to keep your shutter speed at 1/the focal length of the lens. So if you're using a 100mm lens, then your shutter speed should be 1/100. This is a general rule, and obviously only works when the subject that you're shooting is still. Also, using lenses with image stabilization (Canon) or Vibration Reduction (Nikon) will help reduce camera blur. This technology compensates for camera shake by moving the lens around to steady the shot. Motion blur is simple. It means that the photographer used too slow of a shutter speed for the movement in a scene. If you're shooting a sports game, you would almost always want a shutter speed around 1/1000 of a second in order to freeze the motion in the scene. For more on this, check out this article on shutter speed. How to fix it: Use a fast enough shutter speed to match your situation. 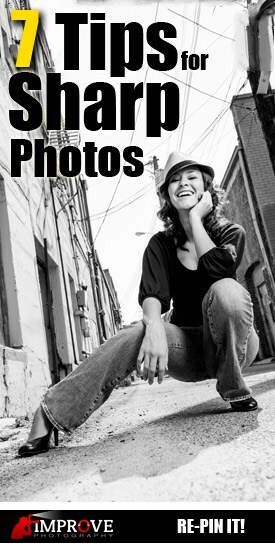 For general portraits, you'll want a shutter speed of at least 1/100. For slight movement (a walking model, for example), a shutter speed of 1/320 will often be sufficient. For fast motion like sports, 1/1000 is generally enough to freeze the motion. The fact is that most photographers start out learning photography on inexpensive lenses. Obviously, it would be nice if all photographers could use expensive pro lenses that capture crystal clear images… the fact of the matter is that most photographers can't afford the pro lenses. That's okay! You can still capture tack sharp photos if you learn to take advantage of the lenses you already own. 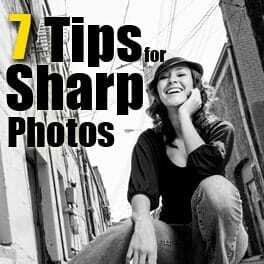 How to fix it: Two quick tips for achieving sharp images from inexpensive lenses are (1) do not use the lens at either extreme of the aperture range. So if your lens goes down to f/5.6, then consider shooting at f/7.1 when possible. This will generally be a sharper aperture on that lens. (2) Try not to shoot the lens at either extreme of the focal range. So if you have a lens that goes from 18mm to 55mm, consider shooting at the middle of the focal range for better results. Each lens is different in this way and has different sweet spots, but these general rules will often produce sharper images. Portrait photographers are often taught to use shallow depth-of-field to achieve a creamy blur in the background of the image. While this is a great technique, I often find that photographers go too far. If you use a very low aperture such as f/2.8, and you use a long lens and stand close to the subject, then your depth-of-field will be razor thin. Often, this means that the photo will show the subject's eyes in focus, but her nose or the back of her head will be out of the plane of focus. In general, it is advisable to increase your depth-of-field just slightly in these situations so that the entire head or body of the subject is in focus. This is especially true when shooting engagement, wedding, or family photography. We often find that photographers who shoot couples or groups use too shallow a depth-of-field and this results in only some of the people in the photo being in focus. How to fix it: Always focus on the front person in the group, or for couples, focus on the closes person to the camera, and increase your aperture just slightly to give more depth of field. The diopter is a (very) small wheel next to the viewfinder on almost all DSLRs that allows the photographer to make minor adjustments to the focus of view that the viewfinder shows looking through the lens. Adjusting the diopter does NOT affect the image recorded by the imaging sensor, but only the view you see when looking through the viewfinder. The reason that adjusting the diopter is important, is that having it set properly will allow the photographer to see in the viewfinder exactly how well focused the image is. This can go a long way in spotting problems such as improper focus while taking the photo. How to fix it: Next time you grab your camera, look closely for a tiny wheel to the right of your viewfinder. You may not have noticed it before, Look through the viewfinder at something about 30 feet (9 meters) away with a long lens on. Carefully scroll the diopter until the view through the viewfinder looks perfectly sharp for you. This will depend on your vision and will not be the same for everyone.